From Cattlemen to Crops: Can Argentina’s Ranchers Cash In on the Commodities Boom? In San Miguel del Monte, Argentina, fifth-generation cattleman Mario Caceres never wanted much more from life than to be a modern day gaucho tending his herd, which a few years ago topped 1,600 head of Angus cattle, the breed that has helped make his country synonymous with delicious cuts of beef. But globalization, modernization and his country’s politics have intervened. Like hundreds of other Argentine cattlemen, Caceres is slowly leaving his cowboy life — if not its spirit — and becoming a farmer of row crops, notably soy, to meet increasing demand from food buyers in Asia as well as biofuel manufacturers in his native country. Since the height of his cattle-ranching career in 2007, Caceres has converted half his two ranches’ 5,000 acres to soy and other row crops while reducing his livestock to 130 head — a token number that he keeps, he says, largely for sentimental reasons. And he’s hardly alone. In the San Miguel del Monte district of Buenos Aires province, virtually all his neighbors on the eastern edge of the Pampas have converted in some degree or other to soy, corn, sunflower and wheat, Caceres says. It's a microcosm of a trend spreading across Argentina. According to the Agriculture Ministry, the national herd this year will decline 22%, to 47 million head from the 2007 peak of 58.7 million head, and is expected to continue falling. Acreage dedicated to cattle ranching in some areas of Buenos Aires province has dropped by half since the early 1990s, according to Gustavo Duarte, a local agronomist advising Caceres and other ranchers on making the shift from livestock to crops. To some degree, the conversion from cattle to crops resembles the transformation of the North American West at the end of the 19th century, when a rising population and a burgeoning agro-industry forced cattle ranchers to move livestock from open ranges to feed lots. The trend spelled the end of the American cowboy, and over several decades, the Argentine gaucho, the nomadic cowboys who once ruled the Pampas, have also been disappearing. But in Argentina’s case, hastening the move away from cattle ranching are the commodities boom and the rapidly rising Asian standard of living that's changing diets and driving demand for soy. In particular, China now accounts for 29% of Argentina’s raw materials and farm goods exports, of which soy is the leading category, according to the government agency INDEC, up from 19% in 2003. Argentina’s annual soy harvest has jumped from about 30 million metric tons in 2001 to a forecasted 50 million tons this year and could grow by another 20 million tons over the rest of the decade as more cattlemen change their livelihood. One reason: The same soil and climate conditions that make it optimal to raise cattle also are perfect for soy. As a result, Argentina is slowly gaining on Brazil as the world’s second-largest soy producer, after the U.S.
Caceres and other cattlemen are succumbing to soy’s irresistible economics. Soy prices have tripled, from US$140 a metric ton in late 2001 to more than US$400 a metric ton recently. While soy is relatively low cost and low maintenance, raising cattle is the opposite, requiring high capital outlays for feeding, fencing and veterinary care. What's more, soy renders up to two harvests a year whereas getting a newborn calf to market can take three years or longer. At the end of the day, farming soy can produce twice the profits per acre that cattle generate, with much fewer risks and headaches, says Duarte. But politics have also been an important factor in the shift from cattle for ranchers like Caceres. To guarantee the domestic supply of beef amid rising foreign demand, the populist government of President Cristina Fernández de Kirchner has limited beef exports by imposing quotas on foreign sales. Ranchers have to apply for permission to export beef, which is denied more often than not, ranchers say. Daniel Kernar, an Argentina analyst with Eurasia Group in Buenos Aires, says the controls are part of assortment of measures taken by the government to stimulate domestic consumption, which it reckons is the key to the president's — and her re-election prospects in October. At first, Caceres and other ranchers opposed the controls, organizing massive protests and closing highways, sometimes for days, in 2008. Now, ranchers have resigned themselves to the world as it is, the blow softened by the huge profits that many are raking in growing soy. 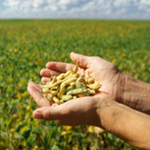 Confident that soy prices will remain high and rise along with Asia’s economies and the purchasing power of consumers in those countries, Caceres concedes that the shift has been lucrative for him. “You can stick to the gaucho philosophy, or you can make the money to afford a BlackBerry, a new SUV, video games for the kids and a trip to Disney World, as I have.” Caceres now gets updates twice a day on soy prices at the Chicago Mercantile Exchange over his BlackBerry; gone are the days when he read about cattle prices a day later in the newspaper. His resistance to shifting to crops for several years produced a steep “opportunity cost.” And even though he and his wife Marta own their ranches outright and are not subject to the sharp rise in land rents as other farmers are, the couple has been hit with property taxes that have risen sharply in tandem with property values. The cost of living is also increasing as the windfall from soy sales filters through the local economy. But generally, the conversion from beef to soy has been very good for Argentina’s economy. The quadrupling of export revenue generated by soy, to US$17.1 billion last year from US$4.6 billion in 2001, has played an important role in the country’s economic turnaround from the dark days of the 2001's peso devaluation and bond default. The soy boom has also stimulated the market for made-in–Argentina farm equipment, like the Apache planters and harvesters on display at the La Rural farm show in July in Buenos Aires, the country’s largest agricultural fair. One salesman at the fair, Carlos Meniavere, reported that unit sales of his machines, whose prices start at US$75,000, are set to increase 20% this year over last year. Because the devaluation a decade ago improved the competitive position of Argentine manufacturers against rivals in other countries, local farm-equipment manufacturers, like Apache as well as Juri Industries, have seen export demand for their equipment take off. In an interview at La Rural, Juri Industries owner Victor Juri said he expects to export 15% to 20% of the 60 machines his company will make this year. Strong exports, consumption and job growth add up to a booming economy. In a recent forecast, the United Nations Economic Commission for Latin America and the Caribbean said it expects Argentina’s economy to grow 8% this year, following 9% growth last year. However, cattle ranching faces an uncertain future in Argentina, and not just because of external factors. The drop in beef supply, for which both the ranchers' transition to crops and export controls have been responsible, has pushed domestic prices up, says Abel Viglione, senior economist with FIEL, an economics think tank in Buenos Aires. “Prices have nearly tripled in three years because of the shortage of stocks, and beef is not a commodity that you can simply create overnight," he says. "It will take years to replenish the stocks.” Controls for milk prices had a similar effect because dairy farmers saw little incentive to invest in their herds, he adds. While higher domestic prices have opened a “path to recovery” for the cattle industry, producers now have to regain market share, agronomist Duarte says. The spike in prices have helped drive down average per-capita consumption to less than 56 kilograms (127.9 pounds) this year, from 72 kilograms per capita in 2009, according to Ricardo Negri, an agricultural engineer with AACREA, a government farm statistics bureau in Buenos Aires. Viglione and others expect President Kirchner to end or curtail controls on farm prices and exports if she is re-elected this autumn because the cost of consumer subsidies, they say, is unsustainable. Policy adjustments aside, cattle ranching eventually will be pushed out of the Pampas and other flatlands to more mountainous "marginal areas,” where the soil, pastures and climate are not as optimal, say Caballero of the Argentine Gaucho Federation. As in the U.S. a century ago, more Argentine beef cattle will be raised in enclosed feedlots, Caceres says, with the possible loss of the flavor that has made range-fed Argentine beef unique. Christian Vasquez, a cattle rancher from Cordoba who was showing his magnificent prize Angus bulls at the recent La Rural fair, said he will hang on with his 600-head herd for now, despite the fact that 95% of his neighbors have switched to soy, and the industry’s highly uncertain future that makes it difficult for him to plan ahead.